Due to several last minute cancellations this season we are offering some cancellation slots for available dates in June and July 2019 with $2,500 off the High Silver and above Stag Packages. These are the same 5 night all inclusive Stag packages as below with our Hunt Guarantee at a great discount due to forfeited deposits. Only a few spaces available. Contact us for dates and more information. Hunt big Red Stags in the lush bush clad mountains of the North Island with bow, rifle or muzzle loader. This hunt includes red stag trophy fee, 5 nights’ accommodation at our lodge, 4 full hunt days, all dining and beverages, open bar, guiding throughout the hunt, use of quality firearms and ammunition, field preparation of trophies and local transfers. Upgrades and additional trophies can be added in field. View our red stag gallery and SCI score guide. *Please note we have a minimum of High Silver (350-375) for bookings in February or March and Silver (325-350) in April. *2 on 1 Stag hunts are based on 2 single hunters hunting with 1 guide and sharing a large room with 1 bathroom. Price per hunter. Each hunter can select a different class of Stag. Add on to your Red Stag hunt, this adventure combines the very best of New Zealand's hunting locations and scenic beauty. 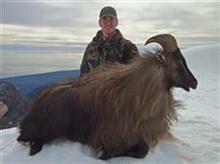 In combination your Stag, Tahr & Chamois hunt will be 6 nights/7days. Includes trophy Fees, all transportation, all helicopter time and inter-island flight, guiding and accommodation. Includes 5 nights’ accommodation at our lodge, all dining and beverages, open bar, guiding throughout the hunt, use of quality firearms and ammunition, local sight seeing and touring, local transfers, field preparation of trophies, and trophy fees for Red Stag (up to 325 SCI), Fallow Buck (representative), Ram and Goat. Trophies can be shared between the 2 of you. Upgrades and additional trophies can be added in field. *Prices in USD and subject to change without notice. HUNT GUARANTEE: Hunting our North Island Estate we guarantee you will see an abundant selection of trophy quality animals and if you don't harvest the trophy you came for we will refund you the full hunt package cost. Trophy Quality: When hunting Red Stag, Elk and Fallow Buck, the hunter is NOT responsible for any extra trophy fees if the animal scores higher than adjudged by the guide. Deposits: To secure a booking, a non- refundable deposit of 25% of the hunt total is required upon signing of the Client Contract. A further 25% is due on September 1 the year before your hunt. Bookings within 6 months of the hunt date require a 50% deposit. We have a US bank account and deposits can be made by check or wire transfer. Balance Due: The remaining balance of the total hunt cost is due at hunt completion, a personal check is preferred. Trophy animals wounded and lost may be considered harvested at the guide’s reasonable discretion and while all reasonable measures will be taken to retrieve such animals you will be accountable for the full trophy fee in such a case. Cancellation Policy: We highly recommend hunt insurance in case of cancellation. If you cancel the year before your hunt your deposit will be retained for future use. If you cancel in the same calendar year as your hunt a 50% loss of deposit will occur, the balance can be used for the following year. Cancellation within 90 days of the hunt will incur a total loss of deposit. Not Included:Trophy expediting, preparation, shipping and taxidermy costs, firearms license and import permit cost (NZ $25), special or private transfers, airline tickets, personal items, insurance, passport and visa expenses and excess baggage charges.